Pharmaceutical Reference Book from C.H.I.P.S. When a pharmaceutical company decides to build a Quality System, it has to face the fact that there aren't any guideline that define exactly how such a system has to be built. With terms such as quality system, quality assurance, and quality management used interchangeably, even defining the system's objectives is a problem. 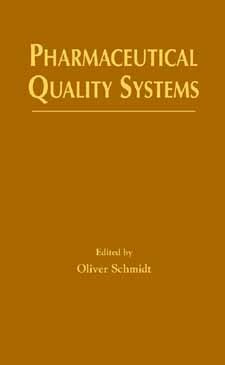 Pharmaceutical Quality Systems provides a practical guide to building a quality system. Beginning with explanations of key terms and concepts, it covers ISO 9000 and GMP and how to combine them, and includes a matrix showing their similarities and differences. Implementation reviews illustrate how Quality (Management) Systems have been installed successfully in pharmaceutical companies. Also covered are the individual components of a Quality System; auditing, validation, and supplier qualification systems; and Hazard Analysis Critical Control Points (HACCP).